Friends, for those of you living in a wi-fi enabled cave, is a science fiction program about six 20-somethings living in a parallel universe Manhattan where there are no black or Hispanic people and two unemployed women can afford a spacious two-bedroom apartment in Greenwich Village. Depending on who you are it was either a moderately funny show with hot chicks or it was like, the best... show... EVAR! Regardless, it's probably showing on TBS right now, so go check it out. Rachel Green: J...ah, not a....wait a minute. What the frappuccino is Rachel? 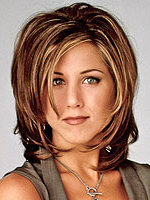 Rachel Green sure sounds Jewish. The writers on the Friends DVD commentary certainly say they wrote her that way. But the character herself is markedly mum. She shows no rooting interest in the famously-unwatchable Chanukah armadillo episode. 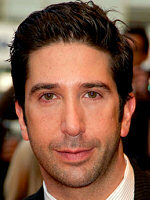 Certainly she and Ross never attend temple together. So which is it? Once again we're left with the old standby situation of someone who appears Jewish but may or may not be, which means we get to choose (yay!). Happily, Rachel's one we want so we're going split the difference and say she's half. On her... father's side (he is a poor tipper, after all).